Let’s be honest, everyone gets snacky sometimes. Your body might be asking you for just a little extra energy to get through the day. That’s why I like to keep healthy, homemade snacks on hand so I have a good option to turn to when the between-meal hunger strikes. I don’t snack every day, I’d rather go ahead and have an early lunch than fill up on snacks. But there are times when I’ve been working extra hard and I feel my body needs a little more fuel. This recipe is a fantastic one to keep on hand for those times. Also, kids love them! 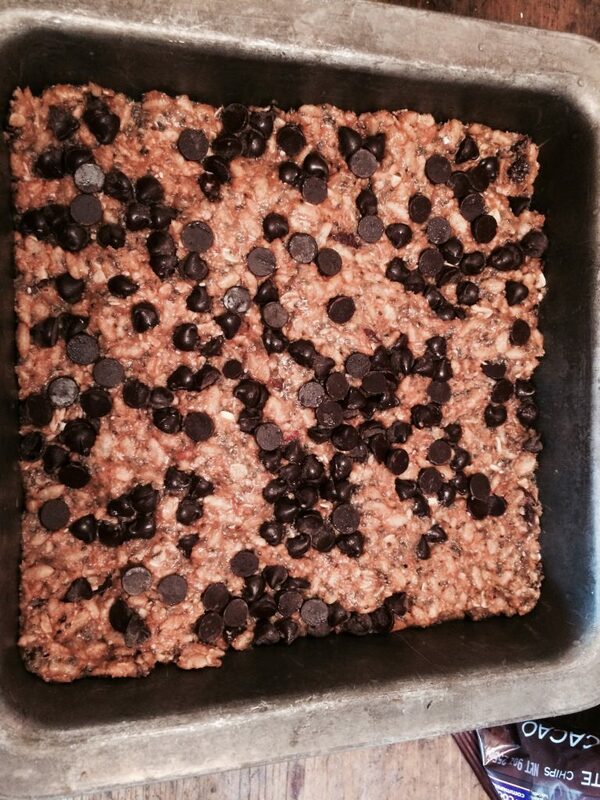 The average packaged snack bar has about 1 gram of protein and 2 grams of fiber per serving. These energy bars have 5.5 grams of protein and 11 grams of high-quality fiber from chia seeds. They also have calcium and antioxidants. 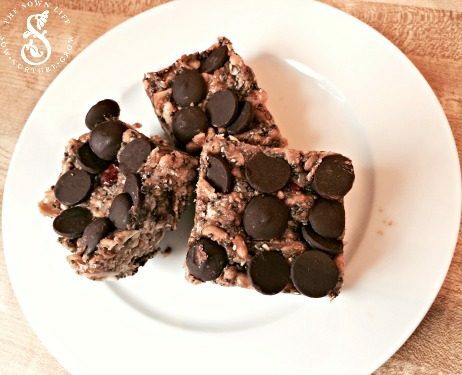 These bars may taste indulgent but they have the right amount of protein, fiber and healthy fat to satisfy and help you feel full. I’ll take it! 1. Combine puffed rice, chia seeds, coconut, oats, almonds and goji berries in a large bowl. 2. In a small saucepan, melt peanut butter, brown rice syrup and maple syrup until fully combined and a liquid consistency. 3. Pour wet ingredients over the dry ones and mix well. 4. Use a 9×9 cake pan. Pour energy bars into the pan and press down with wet hands (I find the mixture does not stick to my hands if they are wet). 5. Press chocolate chips on top of the bars and pop in the fridge until hardened. Remove and cut into squares then store in a sealed container in the fridge. Combine puffed rice, chia seeds, coconut, oats, almonds and goji berries in a large bowl. In a small saucepan, melt peanut butter, brown rice syrup and maple syrup until fully combined and a liquid consistency. Pour wet ingredients over the dry ones and mix well. Use a 9×9 cake pan. Pour energy bars into the pan and press down with wet hands (I find the mixture does not stick to my hands if they are wet). Press chocolate chips on top of the bars and pop in the fridge until hardened. Remove and cut into squares then store in a sealed container in the fridge.